16,517 others viewed this post. 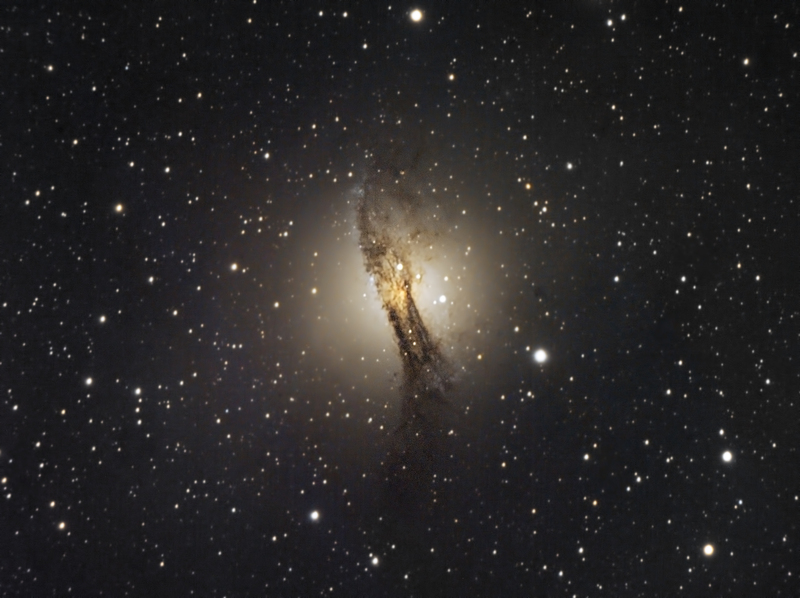 I took this image of the weirdest looking galaxy in the sky, NGC 5128 Centaurus A, over 2 nights but honestly didn’t manage to get enough good data to do it justice. Sometimes called the “Hamburger” galaxy, which I think really undersells how amazing this view is, I think it looks like a brilliant candle. It puzzled early astronomers for a long time who couldn’t work out whether it was a nebula or something else. Eventually they realised it was an elliptical galaxy on an angle towards us, and the brilliant and sharp dust lanes hide a black hole spewing radio emissions to either side. Taken at the full 2350mm focal length of my Celestron 9.25″ Edge HD / F10. 45 mins of Mono Lum with QHY9 CCD and 30 mins of Colour RGB with QHY12. The colour didn’t really work out too well shooting so low and early in the evening, but I’m pretty happy with the details!